" Address Plaques, Mailbox Numbers, House Numbers"
premium Cedar Tinted Alkyd oil and resin based finish that we use on our "Exterior"
custom wood signs. For more information, please visit our F.A.Q. Page. selection of available fonts which can be used for the Coreboxed routing style, click here. matching your address plaque or plaques to a new or existing Custom Wood Sign. larger size or if you prefer to have more information on your Routed Cedar Address Plaque. for matching your address plaque to a new or existing Custom Wood Sign. a discount on additional ones ordered at the same time(same # only). for hanging under your mailbox or from a pole, fence, or other hanging device. line of 3" tall numbers only. below, Graphics, or any combination. Order your Custom Routed Wooden Address Plaques Here! Do Not send a design proof (unless requested) for these before routing them. for just a few dollars more. Contact us for a quote. Order Your Address Number Plaques Here! 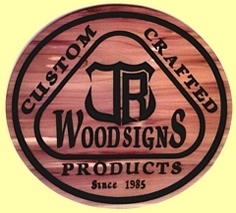 Order now to take advantage of J R WOOD SIGNS' Winter Shipping Special!! Buy with Confidence! Buy from J R Wood Signs! Thank you for visiting JRWoodSigns.com. Custom Routed Wood Signs and Address Plaques. Personalized custom wood signs (and pet plaques) make EXCELLENT GIFTS!! Please order early as Father's Day and Christmas are our busiest times of the year. your order within 7-10 days from the time we receive your approval of the design "proof"